Tools to do what you do best, even better. Legislative updates, sponsorship opportunities and more! Login for exclusive member resources. The Plant Industry Division provides organic certification, nursery stock inspection, produce, plant and seed export certificates, seed inspection and certification, weed-free forage certification, bee inspection and investigations, chemigation (backflow prevention equipment permits and inspections), commercial & private pesticide applicator testing, licensing and investigations, pesticide product record inspections and label registration. Colorado Nursery Program - Access to information on who needs to register and online registration process. EAB News Release - The most recent release. business. We provide expert advice on how to select and properly care for plants and landscapes. Colorado's green industry contributes more than $2 billion to Colorado's economy and provides nearly 40,000 jobs. To access the GreenCO Best Management Practices, Colorado Economic Impact Study and other resources visit the GreenCO site. CNGA and Colorado State University offer the Commercial Pesticide Applicators (CPA) Exam Prep Seminars to help you prepare for and pass the Colorado Department of Agriculture’s Commercial Pesticide Applicators Licensing Exam. The seminars are offered twice a year in both the spring and fall, and include four individual sessions: the General Seminar Parts 1 & 2, the Turf Seminar, and the Ornamental Seminar. All seminars are scheduled from 9:00 a.m. - 3:00 p.m. and include lunch. 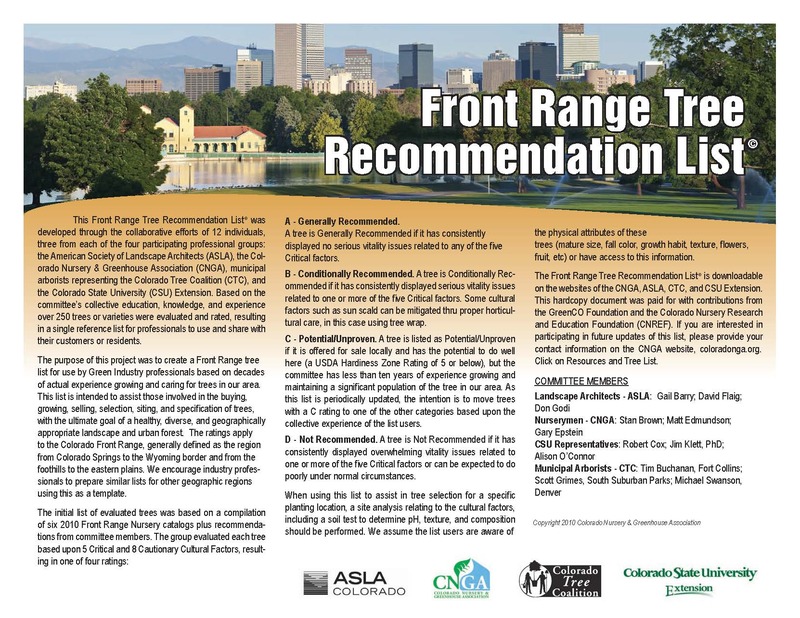 The Front Range Tree Recommendation List was developed through the collaborative efforts of 12 individuals, three from each of the four participating professional groups: the American Society of Landscape Architects (ASLA), the Colorado Nursery & Greenhouse Association (CNGA), municipal arborists representing the Colorado Tree Coalition (CTC), and the Colorado State University (CSU) Extension. Based on the committee’s collective education, knowledge, and experience more than 250 trees or varieties were evaluated and rated, resulting in a single reference list for professionals to use and share with their customers or residents. Each year the CSU Trial Gardens are used to evaluate the performance of annuals and herbaceous perennial plant species and cultivars under the demanding climate of the Rocky Mountain region. Growing conditions are characterized by high altitude, intense solar radiation, drying winds, severe hailstorms, large fluctuations between day and night temperatures, and a season-long need for irrigation. Plants are evaluated for plant vigor, uniformity, floriferousness, and tolerance to environmental and biotic stresses. Top performers are selected by a committee and published annually.